It has become apparent that many people are having troubles receiving email notification from thread subscriptions and private messages. This problem has been passed up through to Internet Brands (site owner) and they have run through their system checks. Everything on their end is running as it should. The problem seems to stem from several ISPs (internet service providers) blocking email from IB's servers. This is due to the volume of emails that IB's servers handle on a daily basis from all of their forums. IB is currently with the ISPs to get them to remove the block. I have checked the status of email notifications sent to Hotmail, Yahoo!Mail, and GMail and all appear to be allowing emails through for me. All of these services are free to use and may be a viable alternative to your current email address if you do not mind getting a new address. In the mean time, I would like to hear from everyone that is having issues with their notifications as you currently have it set up. Please reply to this thread stating what email provider you use. If it is a free service (Hotmail, Yahoo!Mail, GMail, etc), please state that. If your email address is provided by the company you purchase internet access from (Comcast, Roadrunner, Adelphia, etc), please state that. All that you need to provide is what is after the '@' in your email address. Before posting in this thread, please check your current subscription notification mode and private message notification settings. If you do not have 'Instant', 'Daily', or 'Weekly' Email Notification selected in the 'Default Thread Subscription Mode', you should not expect to receive thread notification emails from the site. For private message notifications, you need to have the check box next to 'Receive Email Notification of New Private Messages' checked. To check your settings, go to your profile page (User CP link all the way to the left of the menu bar), click on 'Edit Options' and scroll down to the 'Messaging & Notifications' section. 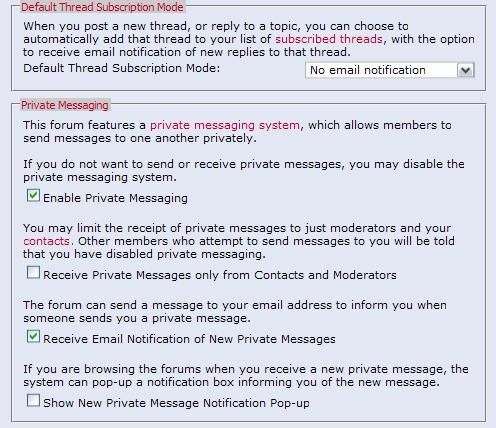 You can change the default thread subscription mode and private message notification in this section. As a note, changing your default thread subscription mode will not change your currently subscribed thread notification mode. For that, you have to select 'List Subscriptions' in the side menu bar, and move through all of your thread subscriptions to update them to the desired notification mode (tedious I know...). We are sorry for the inconvenience and appreciate your patience with this matter. Yes, I've stopped receiving email notifications. I'll almost bet you it's AOL's spam controls. Hopefully I'll be changing emails soon, though. Just recently registered and have NEVER received any kind of notification even though I checked off the correct settings. AOL is one of the worst email providers for blocking domains without checking anything. WOW! I ACTUALLY got an email that you replied to this! Same here! My notifications are now working again. Thanks, Kyle! Kyle, if I may elaborate a little more on this topic. More like a word of caution. If you are using your ISP's provided email service like AOL or Road Runner, it is suggested you also sign up for a free email service through Hotmail, Yahoo or Google mail and use those as your primary email. Should your service through your ISP be disrupted, the chances of checking your ISP email are slim. Never depend on your ISP for email.